Cynthia Ann Stephanie “Cyndi” Lauper is an American singer, songwriter and actress. She achieved success in the mid-1980s with the release of the album She’s So Unusual and became the first female singer to have four top-five singles released from one album. Lauper has released 11 albums and over 40 singles, and as of 2008 had sold more than 30 million records worldwide. What happened to Cyndi Lauper’s Face!!! Cyndi Lauper was the 80’s golden girl with her biggest hit “Girls just want to have fun”. But recently Cyndi was spotted looking like she just had a cosmetic procdure and was in the healing phase. 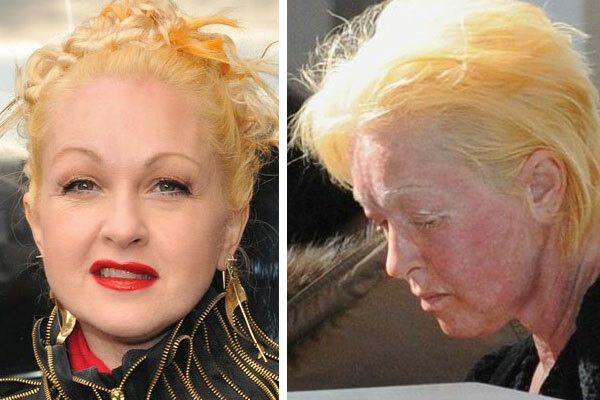 But according to her publicist, recent pictures of Cyndi Lauper looking like a burn victim are not evidence of a chemical peel, but an allergic reaction to a spa treatment. The singer, whose face in the photos is blotched and swollen pink, rushed off into a limo quickly after arriving at LAX. In the age of high definition cameras and video, the pressure to look younger weighs heavy, only surmounted by the pressure to deny one’s own vanity. People will go to great lengths to look young and greater lengths to lie about it. They will douse their face in acid and tell you it’s a sunburn. Or in the case of Cyndi Lauper, a spa treatment. For Cyndi’s sake we hope her face heals soon and she looks better than ever. Do you believe it was a spa mistake, or do you think she had a peel done?